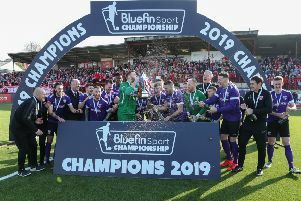 Paul Heatley was again the difference as Crusaders beat Larne 1-0 at Seaview to seal their place in the County Antrim Shield Final. Heatley scoring the all important goal in the 65th minute to seal his side's place in another final. It was a game that never really took off but Stephen Baxter's side will now face either Ballymena United or Linfield in the final after their match was called off last night because of the weather. Crusaders made four changes since Saturday with Billy Joe Burns, Phillip Lowry, Declan Caddell and Michael Ruddy all coming in Mark McCrystal, Michael Carvill, Matthew Snoody and Rory Patterson dropping out. Larne's only change was at goalkeeper with Michael Dougherty replacing Conor Devlin. The Crues Paul Heatley had a turn and shot in the ninth minute which flew wide of the Larne goal. Heatley had another chance in the 19th minute. His volley was on target but was easily gathered by keeper Dougherty. Then in the 25th minute Colin Coates and Martin Donnelly were both shown a yellow card by referee Shane Andrews after difference of opinion. On 32 minutes Crusaders Billy Joe Burns tried his luck but he was well off target as this game ambled it's way to half-time without the fireworks that many had expected. On 40 minutes Crusaders Jordan Forsythe hit a free-kick. It was well hit bur was straight at keeper Dougherty. A large Larne support got behind their team, as the second half kicked off and they were still hopeful of making it through to the final if their team had a big 45 minutes. Crusaders Ross Clarke tried his luck from a free-kick in the 53rd minute. His effort flew wide but the Crues were starting to turn the screw as Forsythe shot just wide of the target with keeper Dougherty scrambling. The game was still waiting to come to life as both sides failed to make the break through they were looking for. Jeff Hughes tried his luck in the 60th minute for Larne. His shot however lacked power and was easily gathered by Harry Doherty in the Crusaders goal. Burns had another go for Crusaders in the 62nd minute. Dougherty was alert to push his effort away. It was 1-0 to the Crues in the 65th minute as Heatley headed home from a Clarke cross. A quality finish from the winger - it was his seventh goal in seven games - but could Larne respond as there was plenty of time left on the clock. The game lulled after the goal as Larne failed to make any headway and the Crues seemed happy to hold onto their lead. Heatley nearly had another chance in the 78th minute, but his touch for once let him down and the chance was missed. The winger had another chance moments later but he scuffed his shot and the chance was lost. Larne kept passing the ball and were looking to work an opening but they were running out of time and they had to make something happen sooner rather than later. Two minutes from the end Heatley unleashed a piledriver which Dougherty did well to push round the post. LARNE: Dougherty, Sule, Ramsey, McEleney, Scullion (Stuart 81mins), McDaid, Donnelly, Tilney, McNally, Cosgrove, Hughes. Subs not used: Devlin, Kelly, Hassin, Gilmour. CRUSADERS: Doherty, Burns, Coates, Lowry, Ward, Caddell, Forsythe, Owens, Ruddy, Heatley, Clarke. Subs not used: O'Neill, Cushley, Snoody, Thompson, Patterson.